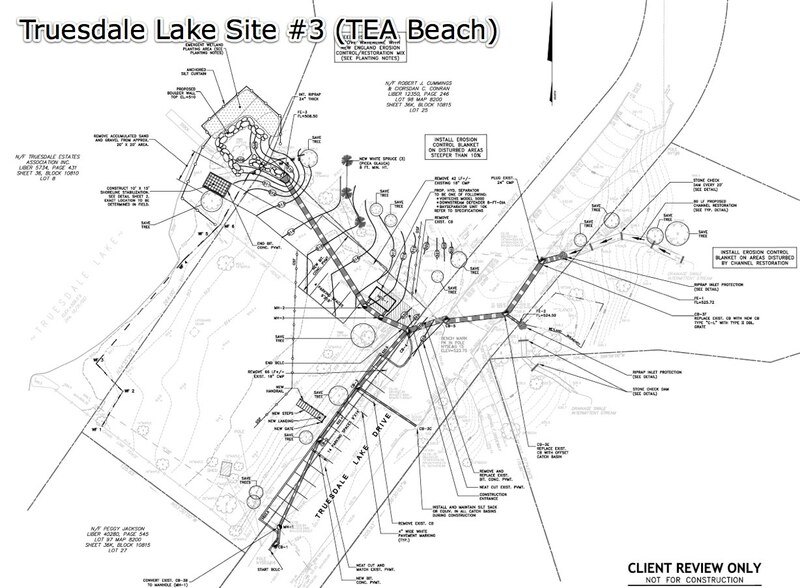 The long awaited stormwater improvements to the stormwater drainage problems on Truesdale Lake Drive near the TEA beach are underway. 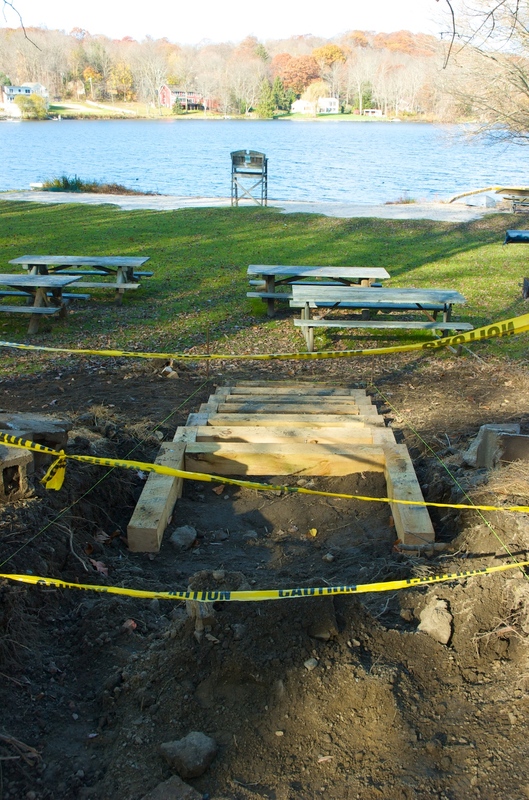 If you have not already seen the work, please stop by the beach area and check in on the project. You can also visit the articles on this site to see more info and photos. The original study was completed in 2001 (maps) by Land Tech Consultants and much work has gone into revising the plan, obtaining approvals, and getting funding. The work will improve the silt catching ability of the stormwater system, covering all of the watershed leading into the beach, The work includes a forebay — essentially a small pond-like area — that will trap sediment and require the town to dredge it periodically. A key piece is also an underground hydrodynamic separator that will also collect sediment further up the driveway. 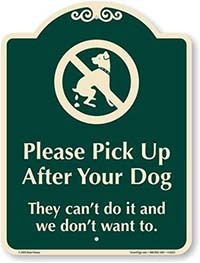 This will also require removal of sand and debris buildup periodically. 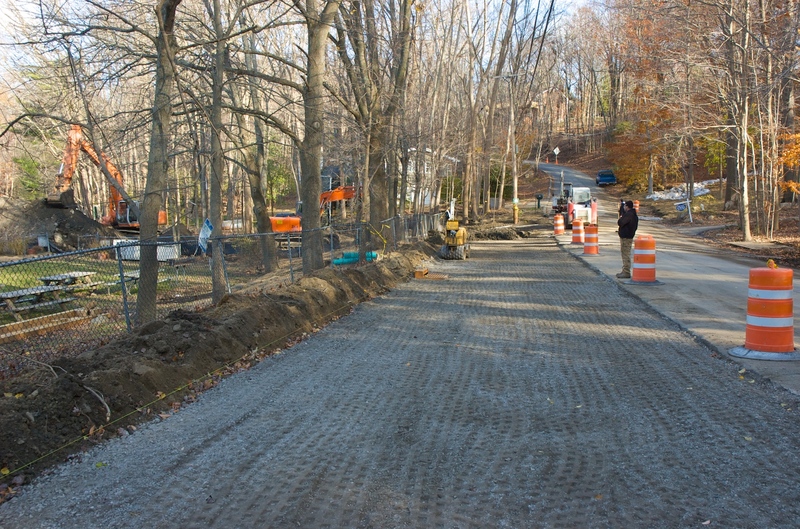 The left hand side of the driveway will remain a driveway for lake access (fire dept, lake treatment) and beach access, (sand, lobster, DJs) but the project means the lower parking lot will lose all parking except for handicapped access. As part of this project, the upper parking lot will be paved and curbed. This has been a topic of discussion for many years at Lewisboro Lake Committee meetings and TEA membership meetings. We are happy to see it come to pass. The entrance to the beach will be relocated from the lower lot up to the upper lot. The new gate will have a set of stairs leading onto the beach property. Note: the estimated cost of the project is $160,000 and is being funded by a grant from the NYC DEP EOH budget with matching contributions from the town. The project would never have happened without the dedication of the Lewisboro Lakes Committee and the support of the Town of Lewisboro. The work is being done by Landscape Unlimited, a private contractor. The original study (from 2001!) through final design was executed by Land Tech Consultants engineer Mike Bartos. Thank you for these notes and photos. Great job Rob!